I’m a longtime journalist and author, Bay Area native and 30-year resident of San Francisco. My book, Great Escapes: Northern California (Countryman Press 2008), covers 30 weekend getaways and day trips in northern California. 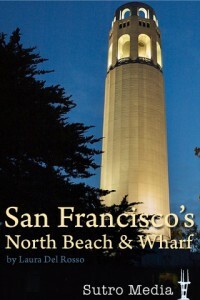 I have a blog on northern California and recently wrote and photographed two travel apps that can be downloaded on iPhones and Ipod Touches — one on San Francisco’s Chinatown and the other on San Francisco’s North Beach and Fisherman’s Wharf. They are guides that include interactive maps, website links and suggestions for restaurants, bars, attractions and historic sites to visit. I love the great diversity of everything: the natural landscape, the people, the cultural activities. We’ve got such a wide range of choices for things to do, from hiking along the coast or in forests, to eating in some of the best restaurants in the world and visiting museums, shopping or exploring a small town like Pescadero or an urban neighborhood like the Mission. Even the weather is diverse. In the summer, you can go from cool fog on the coast to blistering hot in less than an hour’s drive. I love to hike on Mt. Tam and Point Reyes, but I live in San Francisco and, almost on a daily basis, I find myself taking long walks on Crissy Field, in the Presidio (on some of the wonderful new hiking paths that have been added there), or on the Land’s End trail, which, on a clear day, has got to be one of the most amazing walks on the planet. They’ve really done a great job sprucing up that trail lately. I love so many, but I’m partial to Delfina in the Mission because the ingredients are so simply prepared and high quality. I also love inexpensive little neighborhood places. La Taqueria in the Mission is my favorite for tacos and Shanghai Dumpling King in the outer Richmond is my top Chinese spot. I normally don’t recommend chains but it’s a local chain so I don’t mind as much: the La Boulanges around San Francisco. I love their almond croissants with a latte. When I’m in North Beach, I head to Cafe Puccini or Cafe Greco for good espresso. There’s a little place called Alaya in the inner Sunset that I like. If I’m downtown, I’ll go to Zara and Loehmann’s. I’d show them around San Francisco, starting with the top of Twin Peaks if it’s a clear day. People love that and it gives them the lay of the land. I’d make sure to show them the Victorians on Liberty Street in the Castro, take them through Golden Gate Park (people always love seeing the buffalo and the Conservatory of Flowers), the Ferry Building and walk around downtown a bit — Union Square, Chinatown and Yerba Buena Gardens. Then I’d cross the Golden Gate Bridge and go up to the headlands for a view of the city and the bridge from there. If there were time, we’d go to Sausalito, Muir Woods and drive to Point Reyes to see west Marin. Bartholomew Park Winery in the eastern hills of Sonoma, which has beautiful gardens for a picnic and a very interesting, small museum of the area. Tosca in North Beach. You can’t beat the atmosphere. I love sitting in one of the red booths along the back wall, talking with friends and watching people. On a chilly night, have one of those house specialties with steamed milk, hot chocolate and brandy. Visit www.greatescapesnorcal.com to learn more. I absolutely love the Bay Area. I have just returned from BlogHer in New York City and everyone gushes and cheers about NYC. 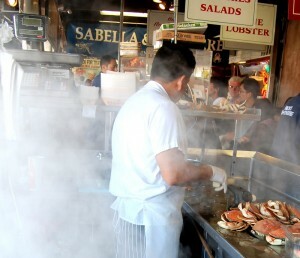 But I think San Francisco is the better city: the climate, the beautiful scenery, the people, the restaurants. Just all of it!